The GRIP opens the world of high performance graphics to the PIP Family. It acts as an interposer for MXM graphics cards with state of the art GPUs from NVIDIA or AMD as well as others. 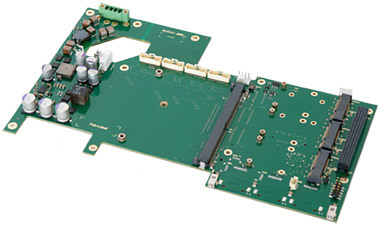 GRIP uses the PCI/104-Express interface to support the maximum interface speed available from the host board. Additional to the graphic expansion are up to 4 mPCIe sockets and up to 4 Mini-SIM modules. The GRIP has been designed to withstand harsh environments and extreme temperature conditions without the need of a fan. The special rugged design, combined with the best industrial-grade components, offer high reliability and and long-term performance.